This is a truly fun way to read about history; the framing device is present enough, and detailed enough, so that you can imagine actually being there, and it's fun knowing where you should stay and eat on your visit to Shakespeare's London! It's not a book to read in one sitting, but it is a very good one to keep around and dip into, especially when there are other people in the room not doing anything important, so that you have someone with whom to share all the interesting tid-bits of information that you learn. I enjoyed it very much. If you are teaching any of the periods covered, especially to middle school kids, you might want to check this out--the accounts are enging, easy to read, and full of information without being dry and didactic. This is not a children's book per se, but if you are the parent of an information loving reader this might also be one to look out for. I would have liked it from the age of eight on up if someone had given it to me (a big fan of history from an early age). I would have liked the look and feel of it (fancy gold embossing), as well as the history within. 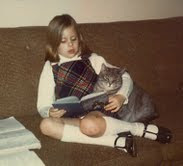 Here is seven year old me, re-reading for the umpteenth time my Ladybird biography of Nelson. I sure do wish I have been given more non-fiction, because although I still have a pretty solid handle on Nelson, there are a gaps that could have been filled by the judiscious applicaton of other books at a young age. 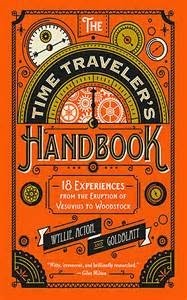 I would have re-read my favorite bits of The Time Travellers Handbook (like the Berlin Wall coming down chapter, and the Shakespeare chapter) lots.